According to our research, Quebrada Palma was owned by Mateo Luchetti Piccioni (1825-1905), born in Rogliano, Corsica, resident of the Danish island of St. Thomas where he emigrated in 1848. Records show he came to Puerto Rico from St. Thomas in 1877 and by 1887 already owned a hacienda called Quebrada Palma in Naguabo. In July 1905, while travelling to his hacienda, he died unexpectedly by drowning when his carriage was overthrown by the waters of the Fajardo River. Mateo was single, never married and had no children. Upon his death, the Court appointed Hernand Henry Behn legal administrator of the estate and on December 1905 declared as his sole and only heirs his 7 nephews and nieces, sons an daughters of his siblings Eugene (Emmanuel Jacob Luchetti Simmons), Sosthenes (Madeleine Luchetti Mendes), Antoine (Catherine, Dominique & Therese Luchetti Roux and Antoine Luchetti Boileaux) and Marie Madeleine (Camille Piccioni Luchetti) all of them reidents abroad. Hernand H. Behn (1880-1933) and his brother Sosthenes Behn (1882-1957) were born in the Danish territory of St. Thomas to Richard William Behn (1840-1889), a German immigrant born in Venezuela and resident of St. Thomas, and Louis (Luisa) Mendes Monsanto (1854-1927) born in St. Thomas of French descent. A year after Richard's death, Luisa or Madame Luchetti as she was later known, married Mateo's brother Sosthenes Luchetti Piccioni (1837-1899), a good family friend and young Sosthenes Godfather. At the time of Mateo's death, Hernand was living in Puerto Rico and working as Traffic Manager of the American Railroad Company of PR. Shortly thereafter, Sosthenes moved to Puerto Rico from New York and together they took over Mateo's businesses. The brothers soon expanded their uncle's sugar growing and processing business and divested into other ventures including Behn Brothers, a company engaged in the sugar brokering business. Like most of the trapiches of the area, Quebrada Palma was destroyed by Hurricane San Ciriaco of 1899, the year of its last grinding season, from then on its sugarcane was processed at Central Columbia . 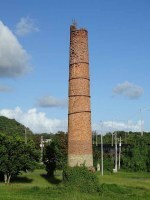 Its smoke stack is located today inside the loop at the exit of PR-53 to SR-953 which is the Naguabo exit. It seems the design of this interchange was done taking into consideration the smoke stack, thus avoiding its demolition. Unrelated to the sugar business but an interesting part of history, in 1898 Mateo had acquired land from Jose Cerra Gonzalez. Hernand and Sosthenes acquired these lands from Mateo's heirs and developed them into what is known today as the Condado area of San Juan. They commissioned the design of Madame Luchetti's residence to Antonin Nechodoma where today is the Condado Plaza Hilton Hotel , and ca. 1911built the bridge today known as "Puente Dos Hermanos" to provide easy access from Condado to Old San Juan. Also unrelated to the sugar business but another interesting part of history, in 1897 the Colonial Government of Puerto Rico gave a 20 year concessions to set up local monopoly telephone service to Sociedad Anonima de Redes Telefonicas de San Juan owned by Rafael Fabian and Antonio Ahumada; to Compañia Anonima de Redes Telefonicas de Ponce owned by Alfredo Casals Agaña and by 1900 acquired by Rafael Fabian; and to Rafael Fabian in Mayaguez. On July 13, 1905 the US Government authorized Pedro Juan Rosaly to establish and operate telephone service on the South coast which authorization was soon transferred to the South Porto Rico Telephone Company who acquired absolute control of the Compañia Anonima de Redes Telefónica de Ponce and the private telephone systems of the Aguirre and Guanica sugar mills. On August 23, 1906 the US Government authorized Sosthenes Behn to establish and operate telephone service on the North coast, which authorization was soon transferred to the Porto Rico General Telephone Company. Immediately thereafter, the PRGTC acquired the telephone companies operating in San Juan and Mayaguez by virtue of the franchises granted by the Colonial Government. In 1913 the merger of the PRGTC with the South Porto Rico Telephone Company resulted in a new Delaware corporation called the Porto Rico Telephone Company headed by Sosthenes Behn. In 1920 Behn established the International Telephone & Telegraph Company (IT&T) which the Puerto Rico Telephone Company became part of and quickly grew into a multinational company that today still exists.